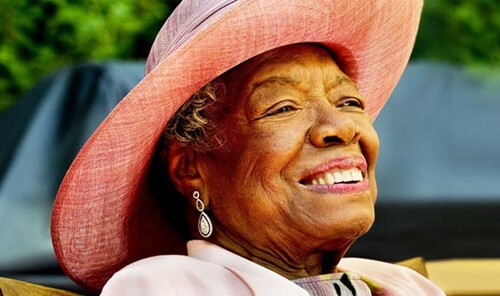 A few days ago, on May 28, 2014, we learned of the death of a beautiful spirit, Dr. Maya Angelou, a celebrated writer, poet and mentor. I had previously written about seeing Oprah's interview with her on March 2nd (Innisfree Moment 008 - Consider the Courageous Snowdrop). While watching a re-run (OWN channel, Super Soul Sunday) and another with CBC's George Stroumboulopoulos on New Year's Eve, 2013, I was again inspired and moved by the depth of this courageous woman's faith, great wisdom, and her insight on life, particularly on courage and ageing. "Courage is the most important of all the virtues... without it we cannot practice any other virtue consistently... one isn't necessarily born with courage, but one is born with the potential... we can develop it in small steps." When asked by Oprah about her age, then 85, Dr. Maya's unhesitating answer was how exciting it was, and how grateful she was that each decade had surpassed the previous one with amazing experiences. Her advice to others: "Do it if you can, age with grace, embrace life." The definition of 'courage' is a personal one, and can change with the circumstances and stages of life. Perhaps reflect on YOUR definition and what it means to you, today. I once thought I 'should' be able to ride a bicycle - didn't 'everybody' do so - but, after attempting in my 30s, chose not to proceed... with NO guilt! Ageing can be a courageous journey. I too can say, at 75, that each of my decades has had amazing experiences. Were there challenges? Yes, many, but ultimately, a 'rainbow'... or a great lesson! Dr. Maya's son said his mother had faith like a rock you could stand on and, when asked if he grew up in her shadow, replied, "No, I grew up in her light". I believe we are each a light to another - perhaps by a smile, a word, a gesture. Please also be a light to yourself, at every age and especially as you age. How? Just be yourself, and know it IS enough!